Bus transport to and from Vejer de la Frontera - times and information. I don't expect this to be my most exciting blog. But since I gave up my car, I've found that information about Vejer's buses is hard to find online and I thought it might be helpful to have it all in one place. Not everybody who visits is able to hire a car, but with a little organisation, our bus service is better than you might think. One of the troubles with online bus information in this area is that the transport companies' websites are quite shy about revealing their timetables and often insist that you give full details about your planned journey before they will issue any information, and this is annoying when you're just sounding out the possibilities. I hope this blog will help. However, for links to Malaga, Portillo/Avanzabus provides many services onward from Algeciras, while Alsa, Daibus and Socibus will take you further afield. Buses leave from two points, La Barca de Vejer at the bottom of the hill and the town centre bus stand in front of the tourist office. Most longer-distance buses arrive and leave from La Barca. Arriving at La Barca, you can get a taxi up to Vejer for about 7 euros. If the taxi driver isn't at the taxi rank, you'll find him in the restaurant across the road. Going down, there are usually taxis on the stand at the top of Los Remedios at the end of the Corredera. If you can't find a taxi, call Taxi Pepote Vejer on (34) 600 511 301. There is a footpath, La Cuesta de la Barca, up to the town from La Barca, though it is steep. Continue up the road past the restaurants for about 100 metres and turn right at the old steamroller. It will bring you out eventually onto the Plaza de España. In busy summer periods, local buses are occasionally oversubscribed, especially those going to the beach at Los Caños or El Palmar, or the last bus to Conil, Chiclana and Cádiz at 7.15 p.m. To avoid being turned away, you can buy your ticket in advance from the agent on the Plazuela, next to the Hotel San Francisco. This is where you should also buy Comes longer-distance tickets. You can buy Comes bus tickets from this shop on the Plazuela.. It's possible to get to and from all the local airports by bus, though connections are not always numerous or convenient. Buy your ticket at the bus station from the appropriate company office, or on the bus if the office is closed. If these times aren't convenient, it's worth remembering that buses run from Algeciras to La Linea every 15 minutes from 7.00 to 22.30 every day. Journey time is 30 minutes. Buses run from La Barca to Algeciras at the following times: 08.05, 11.20, 11.45, 15.05, 16.15, 17.35, 19.45, 22.45. Algeciras - La Barca: 08.00, 11,00, 12.00, 15.30, 16.30, 20.30. Journey time 1 hour 5 minutes, fare about 8 euros. There are regular buses from the airport to the bus station. A taxi takes about 20 minutes and costs about 18 - 20euros. Journey time 1.5 hours approx. Fare - about 9 euros. There are regular buses from the airport to Plaza Las Armas and Prado San Sebastian bus stations. These also stop at both railway stations. Buses to the South depart from Prado San Sebastian bus station. The bus takes about 20 minutes. A taxi from the airport to either bus station takes about 30 minutes and costs 20-25 euros. Seville - Vejer: 9.30 (to La Barca), 12.50 (direct, not Sunday) 14.00 (to La Barca), 17.30 (to La Barca), 20.00 (to La Barca). Vejer - Seville - 07.05 (from outside the Tourist Office, Mon-Sat only) 09.15 (La Barca), 13.35, (La Barca), 16,45 (La Barca), 17,45 (La Barca), 18,30 (from outside the Tourist Office, Sundays only). Journey time, 2.45 hours, fare about 16 euros. There are direct buses to Malaga from La Barca at 08.05 and 15.05. At Malaga bus station, take the airport bus (every 20 minutes, fare 3 euros.) It may be more convenient to take the Comes bus to Algeciras and travel to Malaga from there via Avanzabus, especially from Malaga to Vejer where there is only one direct bus first thing in the morning. Buses from Malaga Airport to Algeciras or the city centre depart from outside the terminal. Malaga - La Barca: 07.30. Journey time about 3 hours, fare about 23 euros. Journey time about 2 hours, fare about 17 euros. Avanzabus also runs two services daily from Algeciras to Malaga airport, at 07.00 and 14.15. The service returns from Malaga airport to Algeciras at 11.30 and 18.50. Local bus service to Cádiz. Vejer (by the Tourist Office)- to Barbate or Cadiz via El Palmar, Conil, Chiclana, San Fernando. LV = Mon-Fri, SDF = Saturdays, Sundays and public holidays. For special occasions, such as the forthcoming Carnival in Cadiz, bus timetables may change. Check the Comes website for details. Conil and Chiclana bus stations are situated a little way outside town. If you want to return to Vejer from Conil by taxi after the last bus, it will cost around 25 euros. Buses leave La Barca de Vejer for Tarifa at 08.05, 11.20, 11.45, 15.05, 16.15, 17.35, 19.45, and 22.45. Services from Tarifa to La Barca depart at 8.30, 11.30, 12.30, 16.00, 17.00 and 21.00. Travel time is 1 hour, cost about 7 euros. I wish there were still a local bus service around Vejer, but it was taken off the road a couple of years ago following a political row. I hope it will be restored soon. Since publishing this posts, I've been asked how to get to the Roman ruins, Baelo Claudia, and the beaches at Bolonia, near Tarifa. These are definitely worth visiting, but alas there is no public transport which will take you all the way there unless you book a tour from Cadiz. However, at 137 Euros, this is not exactly an economical option. The best bet would be to take the Comes service to Algeciras and get off at Facinas or Tarifa, from where you can take a taxi. Frustratingly, though the local bus goes as far as Atlanterra, which is not far from Bolonia, there is no coastal road at that point and you have to take a 40-kilometer detour. Taxis are available from Tarifa, in fact they will come out from Tarifa wherever you are, so the price may not be much different. During the day, a taxi costs around 2 euros per kilometer, making the cost around 50 euros one-way from Tarifa. If your journey involves a longish wait, I recommend that, given a choice, you change at Algeciras rather than Cádiz. All the Algeciras buses arrive and depart in the same place and the cafeteria is comfortable and offers some decent tapas. The bus station opens at 06.00. Some Cádiz longer-distance buses now stop on the outskirts of town, and finding the departure point for the Vejer bus is a little complicated. In winter, you might have an uncomfortable wait. 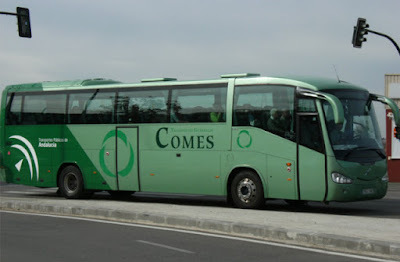 Connections with Cordoba, Granada, Jaen, Huelva or Madrid are possible from Cádiz, Seville or Algeciras via Socibus, Daibus or ALSA transport companies as well as Comes and Portillo/Avanzabus. It's worth doing some research to get the most efficient connections. There is also a Socibus overnight service to Cádiz, but you will have a longer wait for the first bus to Vejer at 09.00. Prices are around 30 euros single and 50 euros return. Socibus buses leave from Madrid to Cádiz at 09.00, 14.00, and 23.59. Return buses from Cádiz to Madrid leave at 8.10, 13.45, 14.40, 21.25 and 23.25. Buses depart from Avenida José León de Carranza 20 on the outskirts of town. Journey time is around 8 hours. Portillo/Avanzabus run direct buses from Algeciras to Granada at 07.30, 14.00 (ALSA), and 16.30. Buses return from Granada to Algeciras at 9.00 (ALSA), 12.00 and 21.00. Journey time is 3 hours, 45 minutes and the fare is 26.36. There is also a Comes service from Cádiz to Granada, but it is quite slow, with a journey time of 12 hours. There is an ALSA service from Algeciras to Cordoba every day at 16.00. 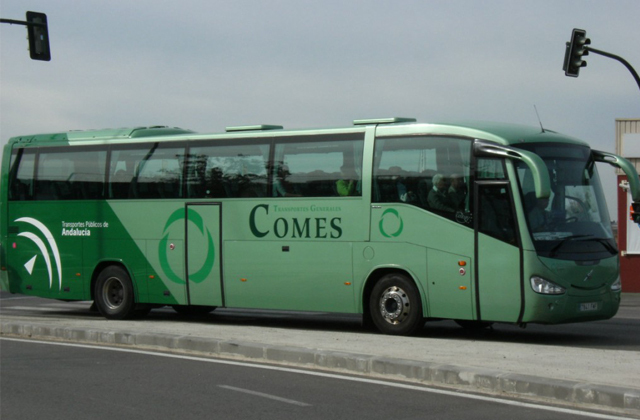 The return bus leaves from Cordoba to Algeciras every day at 08.30. Journey time is 5 hours and the fare is 26.53 euros. ALSA also provides services to Baeza-Úbeda from Cordoba and Granada and between those cities. If you're travelling by bus to Tarifa, it's worth noting that during the summer, there are many delays on the road into town and bus services are sometimes cancelled, in which case it may be better to take the ferry from Algeciras instead. Information from Direct Ferries above.